What Else can I Expect from an Online Bachelor's in Anthropology Program? What Can I Do With a Bachelor's in Anthropology Degree? What Will I Learn in My Bachelor's in Anthropology Program? 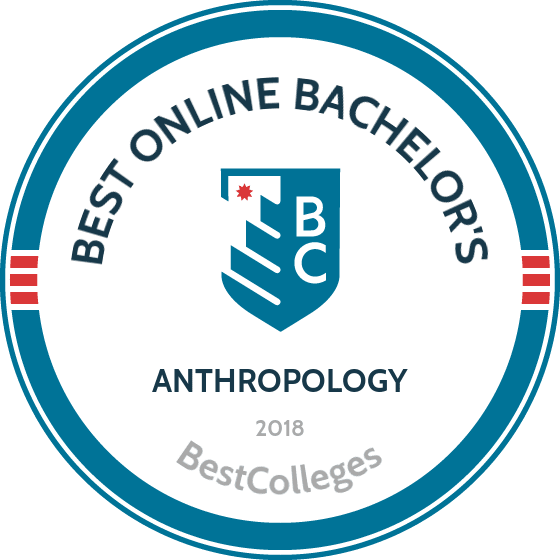 If you're interested in studying how we as humans live, work, and play today or, for example, how humans as a species develop, then an online bachelor's degree in anthropology may be a good fit for you. At its core, anthropology is the study of humankind, and by learning your anthropology degree online, you'll learn about the development, evolution, and cultural history of human beings. Many anthropology programs also allow you to specialize your studies through concentrations, like medical or biological anthropology. Right now, growth outlook for anthropology careers is modest yet positive. According to the Bureau of Labor Statistics, 300 more jobs for anthropologists and archaeologists are expected to be added to the field through 2024. Studying for an anthropology degree online, however, will equip you with strong research, communication, and analytical skills — all of which are applicable to a wide range of career paths. The University of Central Florida, the second largest university in the United States, is a research institution that offers its students quality, access, and value in educational programming. Through its 13 colleges, the school offers more than 210 undergraduate and graduate degree programs in a comprehensive range of fields. The school’s top majors include psychology, health sciences, biomedical sciences, nursing, and mechanical engineering. UCF Online offers a catalog of fully online degrees, including its 120-credit bachelor of arts in anthropology. Earned either on campus, in hybrid format, or entirely online, UCF's program includes courses from the sub-disciplines of the field such as archaeology, cultural anthropology, biological anthropology, and linguistics. Courses include topics such as peoples and cultures of the New World (both ancient and modern), human origins, anthropological theory, and medical anthropology. Program topics cover geographical areas such as Central and South America, Africa, and Europe. This degree program is not available to residents of Michigan, Minnesota, or Oregon at this time. Florida International University, Miami's first public university, now boasts an enrollment of more than 54,000 students. FIU offers 190-plus degree options, including a 120-credit bachelor of arts in sociology and anthropology. Through the program, learners gain skills in workplace diversity, teamwork, data analysis and research design. All students take introduction to sociology, introduction to quantitative social research, and sociological theories. They also enroll in 12-credits of upper-level sociology, geography, and anthropology courses. The program concludes with 30 elective courses. This online anthropology degree accepts applications for entrance in the spring, summer, and fall semesters. To apply, applicants must submit high school transcripts and standardized test scores. Transfer students can count up to 60 credits toward the pursuit of their degrees. To graduate, students need to earn a 2.0 GPA, receiving a C grade or higher in each major course. Students also take a foreign language requirement and 48 credits of upper division courses for program completion. Arizona State University in Tempe, Arizona, offers higher education programs to more than 50,000 students that includes an anthropology degree online. The school's bachelor of arts in anthropology requires 120 credits to graduate. Each of the program's 39 classes takes seven weeks to complete. The program's coursework includes food anthropology, McGlobalization: migration, mass media and McDonald's, and medical anthropology: culture and health. Students completing their anthropology degrees take 45 credits of upper division courses and must maintain a 2.0 GPA both in the major and overall. Students in ASU's anthropology program also do apprenticeship work in one of four different labs. Acceptance into ASU's anthropology online degree requires a high school diploma with coursework in English, math, laboratory science, social science, fine arts, and foreign language study. Transfer students need to complete a minimum of 30 credits at ASU. Upon graduation, students may seek careers as anthropologists, curators, archivists, or sociologists. The University of Florida-Online offers 19 programs, including a bachelor of arts in anthropology that trains future anthropologists, geographers, sociologists, archivists, and public policy analysts. Admission requires submitting high school and college transcripts. Students generally take four years to complete the degree but may reduce that time by transferring in up to 60 credits toward their degree. To complete UF's online anthropology master's degree, students take 120 credits, including 34 in anthropology courses. Core coursework includes cultural anthropology, introduction to world archaeology, language and culture, and a capstone. All students also take introduction to statistics and 18 additional anthropology electives. The program draws from numerous subfields, such as archaeology, linguistics, cultural anthropology, and biological anthropology. Students can choose to concentrate in one of these subfields or take an interdisciplinary track. A Jesuit university in Denver, Colorado, Regis University has four campuses and enrolls more than 11,000 students. It offers 78 online degree programs, including the bachelor of arts in anthropology. This online anthropology degree welcomes applications from students in the fall, spring, and summer semesters. Incoming freshmen need to submit their high school transcripts with SAT or ACT scores. Transfer students can bring any number of credits to Regis but must complete at least 30 through the school in order to receive a degree. The anthropology degree requires 128 credits. Students must take 33 credits in the major, 18 of which are core courses and 15 of which are 400-level electives. Courses include introduction to anthropology, writing as a social scientist, ethnography, and social theory. Once graduated, new anthropologists can seek careers in academia, government, non-profits, or the corporate world. Located in Clear Lake, Texas, the University of Houston educates more than 8,000 students at the undergraduate and graduate levels. Available online, students can complete UH’s anthropology degree in as little as two years. UH's bachelor of science in anthropology is a completer program, which provides junior and senior level anthropology coursework for degree completion. The school admits applicants in the spring, summer, or fall semesters. Students must submit transcripts of credits earned at a regionally accredited school and show an acceptable minimum GPA. To complete a bachelor's degree through UH's anthropology program, learners must earn a combined 120 credits. At least 45 of those credits must be at the junior or senior level. The anthropology courses at that level include contemporary cultural anthropology, gender and sexuality in global perspectives, anthropology of food, and human rights and social justice. Colorado State University is a land-grant institution with a broad range of innovative academic offerings delivered at both the school's Fort Collins campus and online. The school’s 27,000 on-campus students undertake 72 majors and 133 concentrations. Students, both online and offline, benefit from the school's 17:1 faculty-student ratio. Online learning options include undergraduate degree completion programs in areas such as economics, human development and family studies, horticulture, and psychology. CSU's 120-credit bachelor of arts in anthropology affords students an opportunity to learn about people, societies, and cultures through a lens of cultural relativism. This anthropology degree online brings together the fields of social sciences, natural sciences, and the humanities, as students study topics such as modernization and development, human ecology, human biological variation, gender and anthropology, and cultural geography. Online learners have the option to take part in a summer seminar field school in paleontology, archaeology, or ethnography. Located in Corvallis, Oregon State University is a public research university serving around 30,000 students through OSU’s 11 colleges and graduate schools. The school’s e-campus offers 50 undergraduate and graduate degree programs in more than 100 areas of study, including environmental sciences, political science, data analytics, public policy, and education. OSU's 180-credit bachelor of science/bachelor of arts online anthropology degree program meshes the humanities and the sciences. This online degree offers four focus area options: archaeology, biocultural, cultural/linguistic, and general. Course topics include human evolution, cultures in the world, forensic anthropology, and natural resources. Programs are rigorous, flexible, and delivered asynchronously, with classes utilizing the latest interactive learning technologies. Students may transfer credits into the program and all online OSU transcripts and diplomas are identical to their on-campus counterparts. At Texas State University, located in San Marcos, students can complete 25 to 49% of their bachelor of arts in anthropology or bachelor of science in anthropology. Both online anthropology degrees require four core courses in the major, plus 18 upper-division elective credits in the field. Core courses include cultural anthropology, biological anthropology, and general archaeology. Students also complete an internship in which they work and do research in anthropology. Previous interns have served at police departments, on archaeological digs, in forensic science labs, and at primate sanctuaries. Applicants seeking admission to TSU as a transfer student with 30 or more undergraduate hours need to hold a GPA of 2.25 or above and be eligible to return to their previous institution. Those transferring fewer than 30 hours need a GPA of at least 2.0. TSU admits students to its anthropology programs in the spring, summer, and fall semesters. Based in the small city of Troy, Alabama, Troy University provides educational programming to busy students in the state of Alabama and beyond. Troy Online’s catalog of undergraduate and graduate degree programs are taught by instructors ready to provide one-on-one attention, are affordable and flexible, and are designed to facilitate virtual collaboration with peers. Troy's 120-credit, 36 credit hour online bachelor of science in anthropology program focuses on the fields of linguistic, physical, and cultural anthropology. Both online and on-campus students enjoy access to the school's Archaeological Research Center where they may engage in laboratory and field research, including analyzing artifacts and faunal remains from North American and the Near East. The school is particularly notable for offering experiential opportunities and providing students with part-time employment in the field. Employment options for graduates include museum work, historical archives, and governmental agencies. Troy's online anthropology degree also produces the groundwork necessary for a student's entrance into a graduate anthropology program. With a focus on developing analytical skills, online anthropology degrees prepare graduates for a wide range of career opportunities. Many anthropology majors go on to work for nonprofits and cultural institutions, careers where their skills are particularly valued. Survey and research skills that graduates develop in online anthropology programs may also lead them to private sector jobs, which often boast higher pay and better job growth prospects. Anthropologist/Archaeologist: Anthropologists and archaeologists study human behavior and the origin and development of humankind. This career often involves fieldwork to uncover archaeological or physical human remains, or analyzing fieldwork samples in an office or lab setting. In order to pursue this career, students would have to augment their online anthropology degree with a master's or PhD. Historic Preservationist: Historic preservationists work to conserve important or historically significant buildings, objects, or even natural landscapes. They protect historic structures from the threat of demolition or destruction by arguing for their historical significance. Many historic preservationists have backgrounds in archaeology, which makes earning an online anthropology degree with a concentration in archaeology a smart choice for students interested in this career. Social Service Manager: Social service managers run programs that serve communities within clinics, hospitals, and other outreach centers. The background in human development and analysis that an anthropology online degree provides prepares social service managers to understand and meet community needs. Many social service managers start out as social workers before transitioning into a management role. Social and Market Researcher: Social and market researchers conduct surveys, interviews, and focus groups to gather data about consumer habits and preferences and stances on social issues. Earning an online anthropology degree with a focus on research will prepare you for an entry-level position within this field. While a bachelor's degree alone can prepare graduates for some careers in fields related to anthropology, certain career paths may require a master's degree or higher. In fact, 21% of anthropology students go on to pursue graduate studies, studying areas such as law, counseling, sociology, and/or, of course, anthropology in more depth. Pursuing a master's degree in a related field allows you to tailor your career prospects to your specific interests and may help you advance in your career more quickly. Master's in Medical Anthropology: Through a master's in medical anthropology, students explore the intersection of biology and culture — and how they influence one another. This master's prepares students for careers in global or public health. Master's in Visual and Media Anthropology: In a master's in visual and media anthropology program, students explore problems in media representation, how the digitization of visual media affects certain cultures, and the influence of the internet on visual media. Graduates of this program often go on to work in film, media, museums, and galleries. Master's in Economics: Students who pursue this master's degree will learn both economic theory and its practical applications. Anthropology degree graduates may want to earn this master's to further career prospects in the fields of surveying and market research. Human Evolution: Consider the scientific evidence for how humans have evolved over the millennia. Explore the fossil record, our genetic ancestry, and the development of humankind. Archaeology: Understand the past by examining physical evidence left behind by humans. Learn about dating techniques, excavation methods, and how to interpret historical man-made artifacts. Cultural Anthropology: Learn about popular theories within the study of human societies and cultures, and how cultures develop and evolve. Biological Anthropology: Examine the field of anthropology from a biological perspective by studying the behavioral and genetic aspects of humans. You'll look to humankind's closest living relatives — primates — to glean insights into how we've biologically evolved. Most careers related to anthropology don't require licensure or certification. Some professionals, however, may choose to pursue a certification if it's common in their specific field or if it may help them stand out among other applicants for jobs. Some higher level positions within fields relating to anthropology do require certification or licensure. American Board of Forensic Anthropology Certification: The ABFA certification recognizes qualified professionals in the field of forensic anthropology, which encompasses the application of biological anthropology to the field of law. Certified Archivists credential: The Academy of Certified Archivists certifies professional museum archivists, who must pass the Archival Certification Examination and meet educational and experience standards to become certified. Professionals in the field of anthropology may opt to join one of the handful of professional associations related to anthropology — though students are often allowed, and encouraged, to join as well. These organizations connect professionals to one another through conferences and events, job boards, and informal networking opportunities. Some organizations may also grant certifications to qualified professionals or administer certification exams. Register of Professional Archaeologists: The RPA has established moral and professional guidelines for the field of archaeology. Members agree to abide by a code of conduct and are listed in the organization's searchable register. American Anthropological Association: Boasting more than 10,000 members, the AAA is the premier professional organization for anthropologists. The association holds events, provides career resources, and sponsors field schools and internships. Society for Medical Anthropology: A section of the AAA, the SMA supports medical anthropology students, practitioners, and activists around the world through policy initiatives, a published journal, and a job board. Most likely, you'll want to draw from a variety of sources to finance your online anthropology degree. Your search for financial resources should begin with the FAFSA (Free Application for Federal Student Aid). Completing a FAFSA form will show you what federal funding opportunities you're eligible for, like scholarships, loans, grants, and work-study positions. Be sure to check scholarship opportunities at individual schools as well — some colleges earmark scholarship funds for certain majors, like anthropology.